A train from Bishkek to Moscow, and other links. First, over on RFE/RL’s Qishloq Ovozi Bruce Pannier describes the two month wait of people living in Turkmenabat, Turkmenistan. The town had been notified that President Gurbanguly Berdimuhamedov would be visiting — just not specifically when. 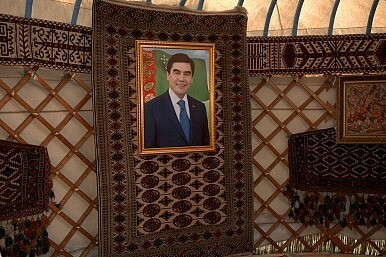 In sadly standard Turkmen style, Berdimuhamedov has deftly paved over his predecessors cult of personality and constructed his own — including a desire for empty streets, smiling faces, and buildings devoid of satellite dishes or laundry lines. So the people of Turkmenabat, unsure of when he would show up, developed a daily routine, including street sweeping and rehearsal for a song and dance number. They found out he was finally coming on June 25, the same day he was visiting. Samuel Beckett’s Waiting for Godot comes immediately to mind. The play is a “tragicomedy in two acts,” which follows two men — Vladimir and Estragon — as they wait for someone named Godot. Early in the first act Estragon suddenly says to Vladimir,“Let’s go.” Vladimir says, “We can’t.” When asked why, he replies: “We’re waiting for Godot.” Despairingly, Estragon replies “Ah!” and the two continue waiting. Spoiler: they never actually meet Godot. At least, Pannier notes, “the people of Turkmenabat know their lives are finally about to return to normal” now that the president has come. In the summer of 1916, Kyrgyz nomads rose up against a World War I-era conscription drive imposed by Tsar Nicholas II’s government. When Cossacks loyal to the tsar put down the rebellion, thousands of Kyrgyz undertook a fateful exodus over snowy passes to China. Local historians claim the resistance and the “Great Flight” – or “Urkun,” as it is known in Kyrgyz – left over 100,000 Kyrgyz dead.